This week, Brigette and her mom visited Biltmore Estate in Asheville, about 20 minutes from the Inn on Mill Creek. Having been to Biltmore too many times to count over the past several years, they now make it a mission when they go to try to see specific parts of the Estate and/or to experience things they haven’t seen or tried. This is actually pretty easy because Biltmore is always adding new experiences. 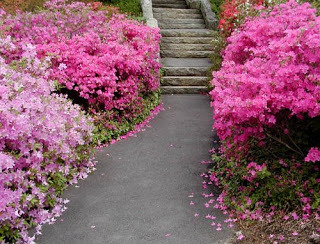 This time, the mission was to see the Azalea Garden at its peak (something they haven’t been able to see before due to timing), to tour the newly renovated suite of four bedrooms above the Library and also to check out River Bend Farm, a celebration of the Estate’s farming legacy. 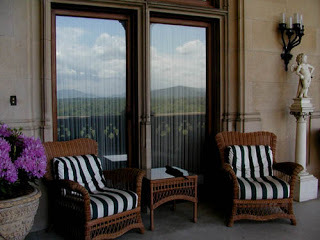 Even though the skies looked ominous when on arrival to Biltmore, there were no worries because a large amount of both indoor and outdoor space makes it easy to plan around raindrops. 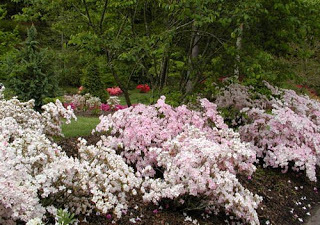 The rain held off long enough to allow for a long walk through the gorgeous 15-acre Azalea Garden. The colors were absolutely stunning! 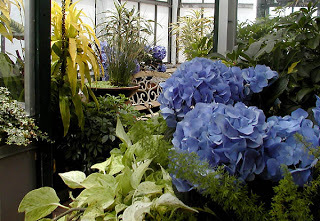 After the Azalea Garden, it was on to one of Brigette’s favorite spots at Biltmore, the Conservatory, with its floor-to-ceiling palms and beautiful arrangements of plants and flowers. After walking past the Walled Garden and up through the Wisteria-lined trellis toward the house, it was time for lunch at the Stable Cafe, the former horse stable adjacent to Biltmore House. A light rain started right after our lunch, perfect timing for our next stop — the house itself. 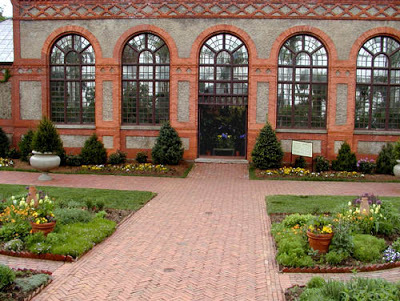 We highly recommend the audio tour for anyone who is a first-time visitor to Biltmore or who hasn’t been there lately. It’s as if you have your own personal tour guide as you make your way through the 175,000 square-foot home. The newly renovated rooms really show off Biltmore’s attention to detail when it comes to restoration. All we can say is, wow, amazing stuff. 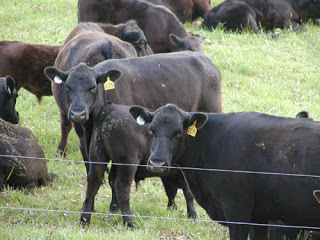 The River Bend Farm was the next stop of the day. By then it was sunny and beautiful. A butter making demonstration was going on and the blacksmith and woodworker were both demonstrating their work as well. 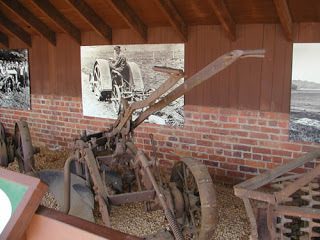 There were also numerous displays of equipment used by Biltmore’s farming staff with accompanying photos of the workers. A video presentation at River Bend Farm that showed what life was like for farming families at Biltmore was entertaining, especially the interviews of the now-elderly children of the farming staff. 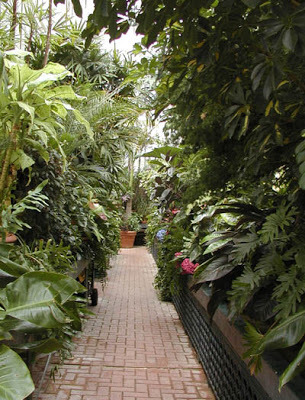 Rounding out the visit to Biltmore was a quick stop by the Winery to pick up some of Biltmore’s Sangiovese wine as well as a bottle of the special Festival of Flowers wine, and finally it was off to the Gardener’s Place, a shop on the Lower Level of the Conservatory. Every time Brigette goes to Biltmore, she brings back a plant from the Gardener’s Place. The Japanese Maples were tempting, but a Chocolate Cosmos was the pick this time. What a fun day! We’re already looking forward to our next trip. If you have the chance to visit Biltmore Estate, you will not be disappointed. 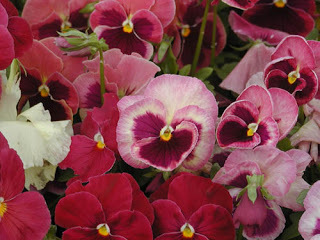 Don’t forget, the Festival of Flowers is going on now through May 17. Additionally, tickets for the Summer Evening Concert series at are now available through Biltmore. 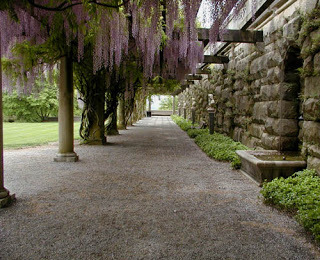 And remember, as a guest of the Inn on Mill Creek, you can purchase discounted tickets here at the Inn that are also good for two consecutive days — perfect for taking your time to explore the 8,000 acres of Biltmore Estate. More information about that is available on our Bed & Breakfast Packages page.